The goodies I purchased at the trade show last week are beginning to arrive. In the picture you can see the first of the new Debbie Bliss Rialto Print DK, together with Button Company button stacks. The rest is the first consignment of HiyaHiya knitting and crochet accessories. 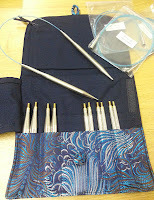 There are two sizes of interchangeable circular needle cases, crochet hook case (this one is mine, I decided to treat myself!) and project bags in beautiful shades of silk fabric. The crochet hooks are also in, but I may have to wait a little while for more needles - I just wanted to give you a flavour and gauge reaction. I love them, and I think you will too! 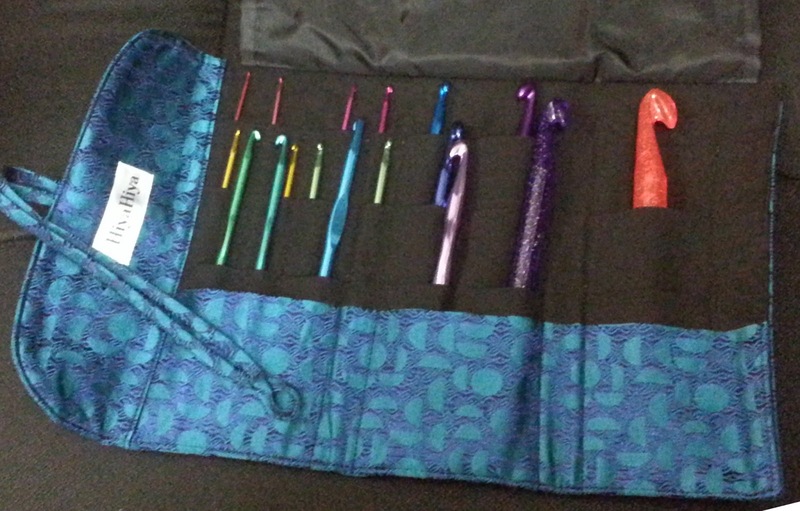 The crochet hooks are aluminium - apart from the two largest sizes which are plastic - and are in such lovely colours; so easy to distinguish between the sizes and the case has plenty of room for hooks you may already have or for other accessories. I have the hooks in stock for sale separately, or you can order your own case full - the needle cases are also available empty. The needle sets have stainless steel 5" interchangeable tips (also available in 4") with two zipped pockets (one outside and one inside) for cables and accessories. I'm very tempted to keep these sets myself too! These sets are just gorgeous! Visit the HiyaHiya website to find out more, and if you are a member of Ravelry, you can visit their group.